Hi everyone! I'm getting a little tired of the titles on these posts (and still have 7 weeks to go!). This seems like the never ending training cycle. Don't get me wrong- I'm still loving training and get excited before I do each and every run. I'm just getting tired of counting the weeks, and every week feels like a repeat of the last. I hope these weekly recaps aren't getting boring for all of you! This was another decent week. I was still recovering from my 20 miler for the majority of the week, and dealing with random aches and pains. I have my next race on Saturday, which I'm really excited about. I'm going to take it easy this week so that I can have a good effort at the race, and then it's all about the marathon in April! I can't believe we're getting that close to race day. I was happy to be back on the morning run wagon! 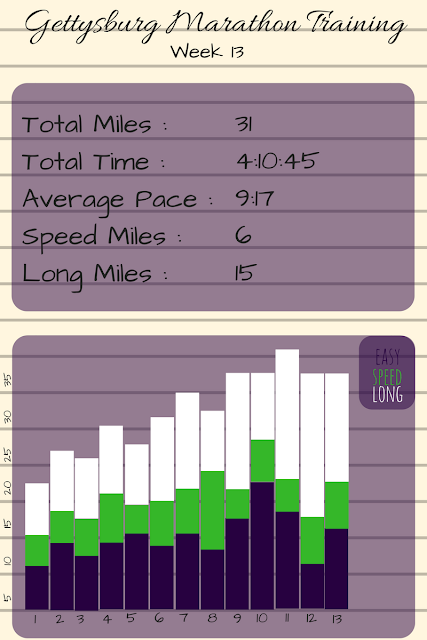 I had three super slow and easy miles planned, because I was still pretty sore from my race on Saturday. I started out in a lot of pain and felt better and better as I kept going. Thank goodness for recovery runs! It was pouring outside in the morning, so I decided to stay in and run on the treadmill. I started out at a 10:00 mile, and sped up a little each mile. I got to catch up on the Bachelor, so overall this was a great (dry) run! I wasn't sure how this speed workout would go since I was still feeling a little sore from my race and have another one next week, so I started out the run at a slow pace and just wanted to get in six miles. After the first mile, though, I felt great and decided to do the speed workout I had planned: 1 mile warm-up with 4 miles at half marathon pace and 1 mile cool-down. My four "fast" miles were around 8:30 pace, which felt pretty comfortable. I feel like I could have gone faster and pushed more, but didn't want to do too much on my week in between races. Nothing like a trail run on a beautiful day! It was pretty chilly out, but really sunny and not windy at all, so it felt great. I took Selma to Riverview Park for an easy 6 mile run on the trails and road. We walked in sections and had a lot of fun. I love running on trails to give my knees and body a break from running on the hard road all the time, and it just feels good for the soul! This was a really tough and frustrating run for me. It was an absolutely beautiful day- temperatures were in the high 30's, but it was sunny with no wind at all so it felt amazing out. I set out to do a hard 15 miles at North Park- adding on the lodge loop and ice rink loop, both of which are really hilly. My legs felt great the entire time, but my left arm was killing me! For some reason, for the past week I've been having a lot of pain in my left bicep. I thought that I just slept on it weird, then when it kept hurting I thought it was because I overdid it with push-ups in a yoga video I did. It doesn't usually bother me when I'm running, but today it was almost unbearable. I made it through my miles (adding in the final 5 at marathon pace), and when I got home I immediately laid down for the rest of the day, put it up on a pillow and iced it (thank goodness Netflix added new seasons of Great British Bake Off!). I hope the pain goes away because it's really frustrating to have a random injury pop up, but thankfully it's not in my legs! How do you deal with weird pains or injuries? linking up with Holly from HoHo Runs and Tricia from MissSippiPiddlin and also with Courtney at Eat Pray Run DC. Great job on your 15 miler. That stinks that a random injury pops up. Well like you said at least it wasn't your legs. Hopefully it'll go away soon and wont continue to be an issue. That is why I do not do yoga....haha. Great work! I love your post. Just take care always and stay fit all the time! I hope that the weirdo pain goes away! That is so random. You still had a great week, so focus on that! Sounds like a solid week of training! I haven't had random injuries in my arm pop up but I've been dealing with some achilles issues so I'm trying to figure out what's causing that. Hope your arm feels better! Such a frustrating random thing! Oh crap! That stinks about your arm. I can see how it would bug you when you're running. I remember my stepdaughter Kylah having arm pain when she first started running because she swung her arm kinda funny on one side. But I know yours isn't from running, but I'm just saying, it can happen! That 15 miler would feel really really tough after running 20 miles for the first time last week. Just be really careful right around now. Be super sensitive and attentive to your body. Awesome job on your long run this week! Sorry that you had to deal with a random injury. i hope that it is feeling better. RnR DC is here!! I'm running it too! I hope your arm pain goes away! did you put anything on it? can you move it? Sorry about your arm pain! I hope you start feeling better soon. I know what you mean about getting tired of counting the weeks and feeling like marathon training is never going to end. 20 weeks is a really long time to train for one goal and it starts to get pretty tedious after a while. But soon enough it will be race day and you'll be wondering where the time went! Speaking of which, best of luck this weekend! You're in great shape and I'm sure you'll have an awesome race! Are you still gunning for a big PR at this one?? How do you survive the loops of North Park! I was dying during Spring Thaw, so many circles and so many hills! Gah! Forget Northpark, let's meet up at a Brewery, wink. Sounds like a pretty good training week! Hope your arm pain goes away! Ouch! I hope your arm is feeling better now! I always seem to have odd injuries, haha. Have you ever considered a 1-5 word summary of your week to add to the title? I did that once & liked it since it was easy for me to find recaps afterwards but sometimes it was a little tough to come up with the summary. Awesome that Selma can run 6 miles with you! Greyhounds are sprinters not endurance runners so it would take a long time to train him to run that long. Hmmmm, you made me want to do a trail run soon! Hope your mystery arm pain goes away soon!